Being about 6 foot 1ish the standard Brompton seat pillar was never going to be comfortable. When I originally bought my Brompton I opted for the basic extended seat pillar, which was served me well. I have longed for the aluminium telescopic seat pillar for quite a while and today it arrived in the post. The before with my extended steel seat pillar. It does stick out a bit. The aluminium telescopic seat pillar. The aluminium version is normally only available if you buy the titanium version of the folding wonder. You can of course get it as an after market purchase as I have done. I wanted this seat pillar for a number of reasons. Being a taller rider I definitely need the extra reach it affords. In addition the telescopic seat pillar when folded down doesn't really protrude a great deal. As you can see in the picture above of the original, it does. When I took the bike out for a test ride I was very pleased. With the old extended seat pillar I simply had it up as far as it went. With this new seat pillar I can go beyond that maximum height. 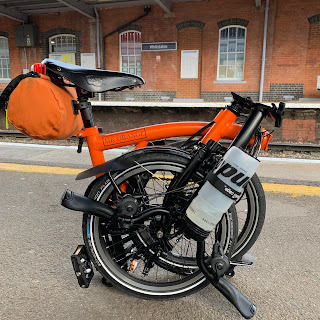 I may well only be increasing the ride height by a few millimetres but this proved telling as I found my Brompton more comfortable and on an extended cycle I would really feel the benefit. This will greatly enhance my chances at the BWC to get under that golden time of 30 minutes. Doesn't stick up as much. Would be even lower if I put the saddle rails on the bottom of the penaclip. I am very pleased with this purchase and if you are like me and over 6 foot, I can really recommend it. If you can stretch (no pun intended) to the cost of the aluminium seat pillar over the steel version you won't be disappointed. I see Action Bikes are selling Brompton Aluminium Telescopic Seat Pillar. I've been wanting one for months, but assumed they had been discontinued... Do you have weight differences between this & steel version? Have you had any issues with yours? Your comments would be appreciated & BTW great blog! No issues with it but don't really use it a great deal. My former S2L Raw Lacquer came with a steel telescopic post and when I sold that bike I kept it. Only a few grams lighter so I wouldn't fuss too much about it, save the money and buy the steel version. Thanks, but I'm not sure I fully get it! Your aluminium version in this blog seems to have a steel main section? Am I correct in assuming Brompton do an all steel both parts one & steel/aluminium one? Or do they also do one with both parts aluminium!? Hello Phil. They actually look the same. The only visual difference if that the rubber bung on the aluminium post is light grey rather than the black of the standard. The black bung won't fit in the aluminium post as it has a different taper.